Japan’s sewerage industry has found a way to clean up its dirty and smelly image: elaborately designed and colourful manhole covers with 12,000 local varieties nationwide — including, of course, a Hello Kitty design. 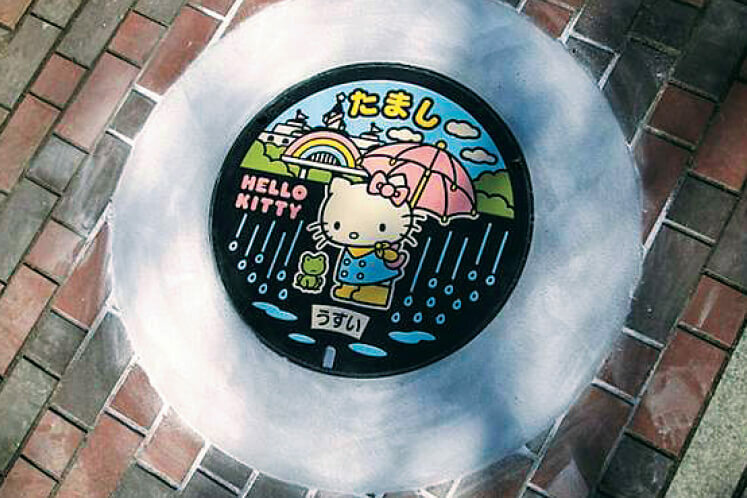 Appealing to a Japanese love of detail and “kawaii” (“cute”), bespoke manhole covers adorn the streets of 1,700 towns, cities and villages across Japan and have spawned a collection craze among so-called “manholers”. The designs represent an instant guide to a place as they feature its history, folklore or speciality goods: a castle design for an ancient town, a bay bridge for a port and Mt Fuji for a city at the foot of Japan’s iconic mountain. He later learnt the imaginary birds were a symbol of the town’s rise from a 1945 devastating US air raid and a deadly earthquake three years later. “I sometimes do research on why the town has that particular design. I’m impressed whenever I find out, it represents the town’s history and culture,” said Morimoto, who coined the word “manholer” for like-minded people. But to satisfy collectors’ desire, the private-public GKP network designed to promote awareness of the importance of sewerage in society, has released 1.4 million cards of 293 different covers. The eastern city of Maebashi held a highly competitive lottery in October as its offer to sell 10 used manhole covers — 40kg of iron — at ¥3,000 (RM107.31) each was swamped with more than 190 bids. Cover designs must have the same friction level no matter which direction humans or cars come from, so that people do not slip over them. This need for friction resulted in placing extra streaks of clouds, sea waves or tiny stars in the background, giving birth to “condensed designs”, Yamada said. A plain cover costs some US$600 (RM2,370) but a colourful, designed one can be double that depending on the number of colours used and the level of detail used.